The Core Events Accreditation for Technology is a training program designed specifically for software or infrastructure technical engineers and consultants who will benefit in building professional competencies. When it comes to working directly with client infrastructure issues, technical support, software development, or migrating technology platforms, professional aptitude is as important as technical acumen. Our Core Events educational program consists of training and development on four primary certification platforms: Leadership, Communications, Customer Relationship and Diversity. In this rigorous training program technical participants will learn how to engage, communicate, lead and produce up-sell opportunities for future engagements. Gaining recognized credentials sends an important statement to your industry specific business community, and to your client base. Our goal is to match your technical acumen with professional competencies making participants proficient in the board room as well as in the server room. Our certified trainers come on site for organizational training or individual training is conducted monthly at specific locations world-wide. 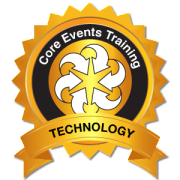 Core Events Accreditation for technology is based on a per person rate (Group discount available).